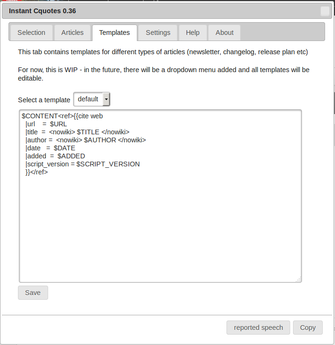 Screenshot showing the web-extension port of the InstantRefs user-script in FireFox. It is being developed and maintained by a group of volunteers involved in maintaining the wiki and in trying to provide more up-to-date information to end-users who may not be as involved in the various FlightGear-related communication channels. FlightGear's development is, at best, "self-coordinated", meaning that contributors discuss ideas and make proposals to contribute in a certain fashion and then team up to implement certain features and building blocks, often just temporarily. Unfortunately, due to a lack of development manpower, many ideas are not implemented immediately; it is, thus, important to know their pros and cons, as well as who originally proposed them and/or might help with their implementation, even after a long time, preferably with links to the original discussions so that new contributors can decide whether to get involved in some effort or not. The project documentation, however, is in great need of improvement and usually significantly lacking behind: many core developers update it seldomly, if not anymore, as it takes time to write it, as well as an understanding of the inner workings of a complex system such as FlightGear. Furthermore, this task might not be attractive due to its short term impact on the project, and it is overwhelming to think about creating documentation that would address the needs of many different kinds of contributors with different backgrounds, experience levels and goals. Forum and mailing lists discussions have therefore become the only up-to-date (albeit difficult to filter) source of information about recent development progress; this makes it tricky to know what is going on, what needs fixing, what were the decisions taken by the developers. The aim of the Instant-Refs script is to help wiki editors to copy relevant excerpts from such sources, formatting them as proper quotations, and help bootstrap new articles collecting them until a dedicated rewrite is made. It can also be used to reuse announcements to update the changelogs, newsletter or the Release plan/Lessons learned page. After being away from the wiki system for some time it becomes more of an effort to re-learn how to start a new file and figure out how to format it , with what headings, etc. Sometimes it is almost too much to do the original write up of the original post and all the work of that layout and effort to have to also duplicate it in a wiki article. If I was a little more current and affluent with the wiki editor, I might not be so hesitant to create the work there instead of the forum. In a few cases, such collections of quotes helped not only create bootstrap new articles, but even actual features, too. In other cases, quotes have been used to update documentation of features whose maintainers may not be actively involved in FlightGear (e.g. Rembrandt), to help document discussions that are taking place in the meantime, and provide some background information for people interested in the corresponding feature. As of version 0.30, a dedicated configuration dialog is in the process of being added, so that certain script features can be dynamically configured, without having to edit the script. For now, this is merely a placeholder that provides a checkbox to easily enable/disable the debug mode. In the future, we are hoping to also expose other features this way. 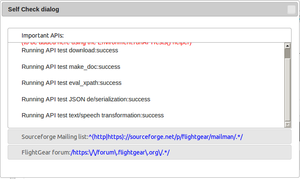 Go to some mailing list archive URL, for example  or any forum message, such as Re: Get objects to show up on Map/Radar on the forum . Select the relevant portion of text. When you release the mouse button, a box will appear containing the converted text (for now, mainly properly-referenced quotes for the wiki). The text will be automatically selected and copied to the clipboard. 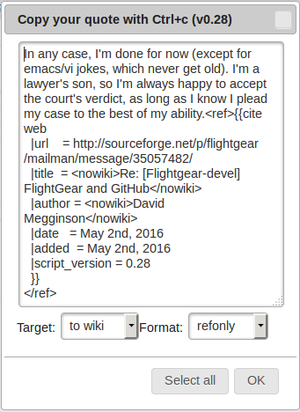 Paste the text into the desired wiki page. The upcoming FlightGear version (3.2) will contain a canvas-based map dialog, including a modular "plugin" system for creating custom map layers and charts with roughly ~50 lines of code, most of it boilerplate. — Hooray (Jun 14th, 2014). 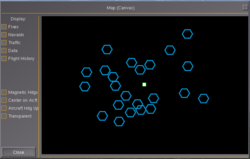 Re: Get objects to show up on Map/Radar. See FlightGear wiki:Quoting Guidelines for the main article about this subject. 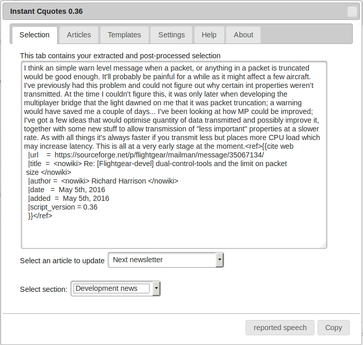 Using the Instant-Cquotes script is a good way to bootstrap and write some preliminary notes; however, while quotes might be useful to understand how undocumented subsystems and features work and are definitely better than nothing, they are not meant to replace proper, structured and well-written wiki articles. 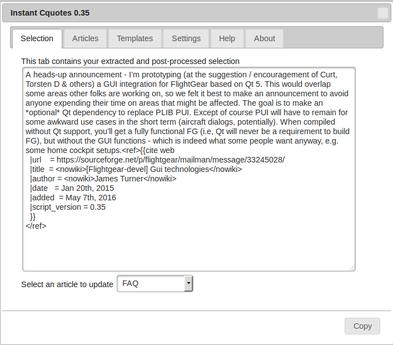 One way to convert pages bootstrapped using quotes is to extract relevant information from them and keep citations only as references; in case important details are missing, they can be asked for on the mailing lists (on the forum, the chance to get a complete answer might be lower). Another option might be moving the quotes to the Talk page for each entry, which would preserve the sources without clogging up the articles. As a matter of fact, the whole paragraph above was assembled using this approach; to see for yourself, look up the references at the end of this page. For another example, see TerraSync#News. Note A Chrome/Chromium-specific extension that will not need Tampermonkey installed is under development. Adding a new source is pretty straightforward if you understand how xpath and regexes work - basically, you only need an archive (e.g. gmane), and then determine the xpath of each relevant field, as well as the regular expression to process the extracted fields (optional). Next, you need to navigate to the configuration hash to add a new website to it. Now, we need to review/adapt the profile according to the new archive we'd like to see supported. Next, it makes sense to use an XPath checker, so that we can look up the xpath expression for various HTML elements, and add those to the configuration hash above. For testing purposes, you will probably go to the setup dialog and enable the DEBUG mode, and use your browser's console to see what is going on. Most maintenance work will typically involve reviewing/maintaining a few configuration hashes, that contain meta information for each supported archive (mailing list/forum). Usually, each hash contains a combination of xpath/regex expressions to look up the relevant information, as well as vector of optional transformations that are applied (in order) to convert contents to a different format (e.g. dates). For regression testing purposes, there's a dedicated "self check" dialog that will be extended over time. For now it will download a few profile/website specific postings using a vector called "tests" and then log the posting's title, author and date to the console. The next step will be actually showing that information in the dialog itself - there's a separate helper function to accomplish that, so that the corresponding div layer can be updated with the results. 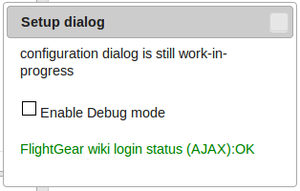 For now, the setup dialog will try to obtain a login token for the wiki and show a message if successful. 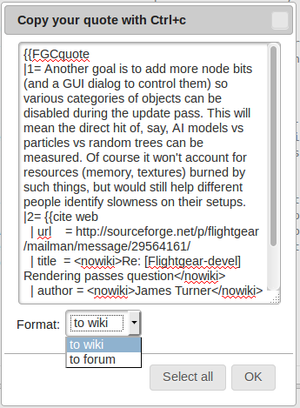 In addition, the profile/website hash also contains a new wiki entry for the FlightGear wiki, whose event_handler callback will be invoked once the FG wiki is visited - the console/log will show a greeting, so that is where other code can be added - e.g. 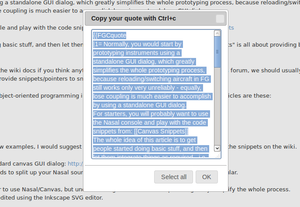 to help clean up/rewrite FGCquote-based articles automatically etc. There is a vector of "modes", whose members are a hash containing trigger/handler fields, linked to two callbacks - the trigger callback can be used to check some condition, while the handler will be invoked if the trigger returns true. http://forum.flightgear.org/viewtopic.php?f=18&t=27054&start=90#p273972 → selecting from “As promised, two sample installation sessions on Linux” to “That's it.” towards the end of the message causes Iceweasel (Firefox) 44.0.2 to display a dialog box reading “A script on this page may be busy, or it may have stopped responding. You can stop the script now, open the script in the debugger, or let the script continue.” The line below reads “Script: chrome://greasemonkey-modules/...quotes/instant_cquotes.user.js:544”. Choosing Continue doesn't help: the same message reappears a few seconds afterwards. resolve footers : "I believe that because of [x] ... [x]: " -> "I believe that because of (x)"
introduce "layouts" (templates) for different purposes: newsletter, changelog, wiki article, The Manual (LaTex) ? make syntax highlighting configurable (language, mode) ? The userscript times are over meanwhile, the script has been ported to use the web extension framework - please don't update the user script. thanks ! ↑ John Denker (Jul 16th, 2007). [Flightgear-devel] development process (was: chaos...). ↑ 2.0 2.1 Curtis Olson (Jul 27th, 2011). Re: [Flightgear-devel] The state of things in Flight Gear. ↑ Hal V. Engel (Jul 27th, 2011). Re: [Flightgear-devel] The state of things in Flight Gear. ↑ Thorsten (Mar 21st, 2016). Re: quoting on the wiki. ↑ James Turner (Mon, 28 Jul 2008 10:06:05 -0700). [Flightgear-devel] Project tracking. ↑ wlbragg (May 9th, 2016). Re: Breaking down NLCD raster image . ↑ bugman (Apr 17th, 2016). 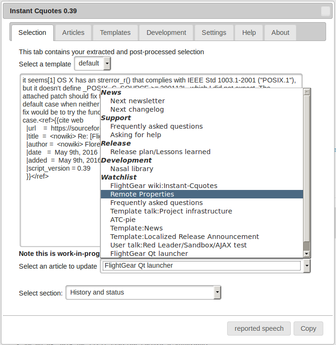 Re: What is the QT launcher?. ↑ James Turner (Mar 21st, 2016). Re: [Flightgear-devel] Wiki Quotes. ↑ Stuart Buchanan (Mar 19th, 2016). Re: [Flightgear-devel] Wiki Quotes. This page was last modified on 10 January 2018, at 13:49.